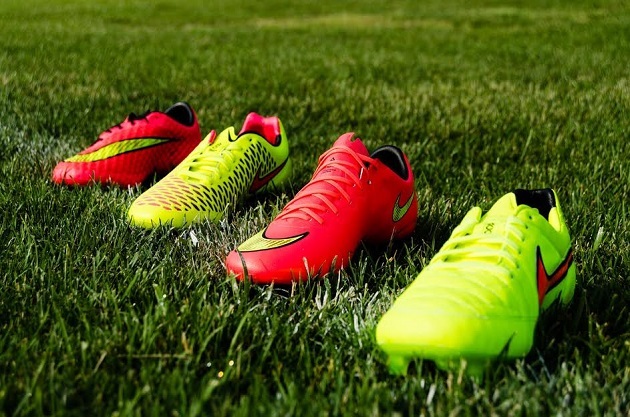 While there may be more marketing to come, and perhaps the odd boot or two to actually be launched in the midst of the World Cup, we have been given a view of what all the major boot companies will have on show during the biggest stage that soccer provides. So, now that we have seen what all the major players will be wearing during their trip to Brazil, it is time to do what people sitting on the sidelines do best: judge them. Which company put their best foot forward for the summer? And which company took a definite step back? While smaller brands like Lotto, Diadora, Warrior, Joma, Mizuno, and Under Armour will be hoping to merely gain some time on the pitch during the “big dance”, we are going to try and explain how the big boys have fared in the biggest venture since 2010. 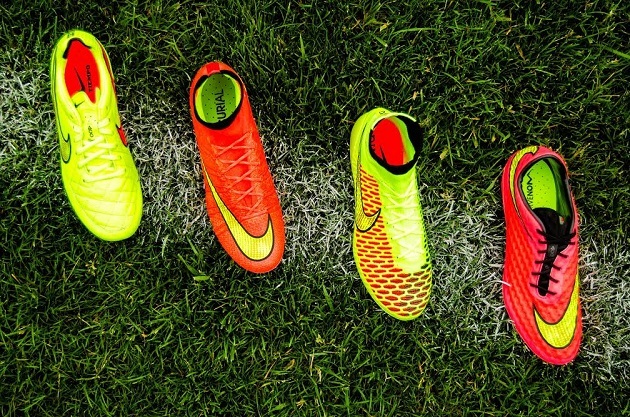 For Nike, the lead-up to Brazil has actually been a long time coming. While we did not see the entirety of their line-up until the end of April, the Magista was unveiled very early into 2014 (quite the opposite of how adidas have used the new Predator). 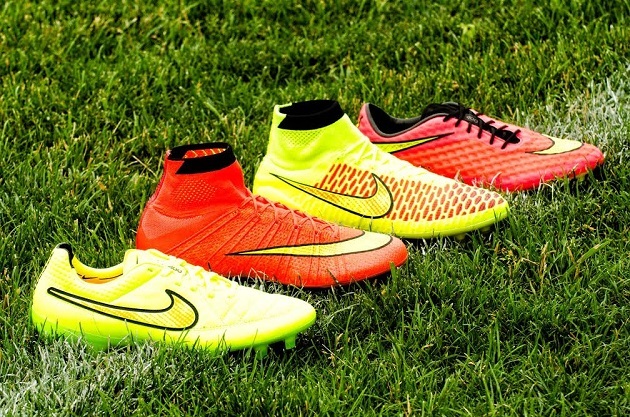 Seeing how popular Nike boots had been during and after the 2010 World Cup because of their easy ability to be spotted on camera during television broadcasts, it came as no surprise to see Nike unveiling very bright colorways. However, instead of a purple-tinged silver with an orange heel, Nike have adorned half of their silos in predominantly volt colors and the other half in a bright pinkish color (called Hyper Punch). While there are some detractors claiming a lack of originality in the World Cup colorways, these naysayers have obviously not watched any soccer on television in the last few weeks and have not taken the new technology that Nike have slapped on their boots into consideration. While watching any of the games that have been building up to the World Cup, the volt Tiempo and Magista definitely leap off of the screen. While the HyperVenom might be the sedated of the bunch, the Venom, Superfly, and Vapor X are still very easy to spot from a distance. And, unlike the adidas bunch, are fairly easy to differentiate from a distance (especially with the added ankle sock to the Superfly and Magista Obra). The one interesting thing here is that Nike will have to be wondering how much advertising power to put behind the second tier releases in the Mercurial and Magista range as a large contingent of their players have opted for the Vapor X and Magista Opus. Still, Nike show that they are still a fair bit ahead in terms of marketing and knowing what will be easy to spot on the pitch. As with the post we did for the adidas World Cup outing, we would not write an article about any boots on the market without actually testing them. In regards to full disclosure, we have not yet tested the Vapor X, but the other top boots have all been given some serious testing here at The Instep. 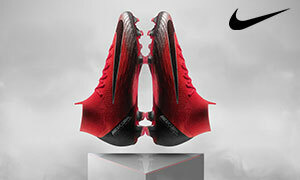 For Nike, the boots are extremely impressive. While the Hypervenom, Magista, and Superfly all entered into the market with The Instep staff being very skeptical, they have all proven themselves as out-of-this-world products. Not to mention that the new Tiempo somehow improved upon a very storied silo and Nike boasts the only two silos in the market to truly have two-tiers that can be considered “top” tier. Anyone doubting any high-end boot from Nike means one thing: they haven’t worn it yet. For Nike, the grades are generally very high. We give the general idea of these boots an A-. We give the execution a B+. And, after testing all of the boots, we give the quality therein an A (very high quality, but no boot is perfect). 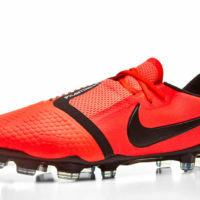 Despite a lack of originality in colroways from Nike, the new technology on the boots and the ability to see the boots from space keeps the general idea grade of Nike’s boots very high. The only thing that can truly hurt Nike now would be for Messi to win the World Cup while playing any team whose kit (and most of their players) are sponsored by a different brand.